Arvind Kejriwal appealed to the masses to find someone "educated" for the job of the country's prime minister. 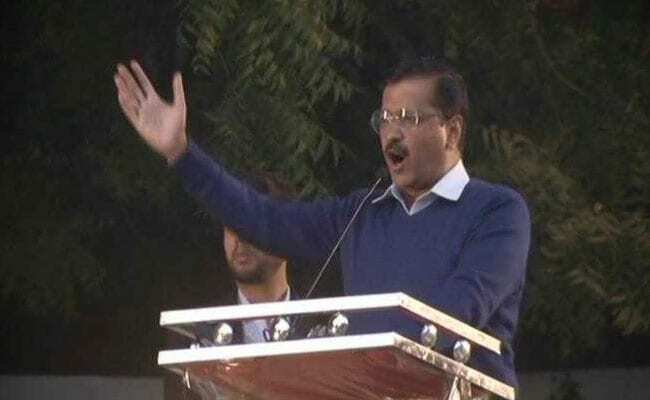 Delhi Chief Minister Arvind Kejriwal on Wednesday took a dig at Prime Minister Narendra Modi as he said people of the country had chosen a prime minister who was just "Class 12 pass". He appealed to the masses to find someone "educated" for the job, as, he said, a "Class 12 pass" doesn't have an understanding of where he is putting his sign. "Last time you made a Class 12-pass the prime minister of the country. Do not commit the mistake this time and find someone who is educated because a Class 12 pass (person) doesn't have the understanding where he is putting his signs," Mr Kejriwal was quoted by news agency PTI as saying at the opposition rally in Delhi. Details of Prime Minister Narendra Modi's Delhi University degree had been sought aggressively by Arvind Kejriwal and his Aam Aadmi Party over the years. Telugu Desam Party chief N Chandrababu Naidu, who also attended Mr Kejriwal's rally, joined the AAP leader in demanding an "educated PM". "I appeal to the citizens of India that they must choose wisely before they cast their votes in the upcoming elections. India has great potential for growth and it needs an educated PM to lead it. This country does not need an oppressor who will destroy democracy and constitution," he tweeted. Mr Kejriwal's "Tanashahi Hatao, Loktantra Bachao" rally was attended by opposition leaders including Mamata Banerjee, Sharad Pawar and Chandrababu Naidu. After the rally, opposition leaders met at Sharad Pawar's house in Delhi and tried to broker peace between the Congress and the AAP, who last ruled out the possibility of an alliance for the upcoming Lok Sabha elections. Sources said part of the discussion was on a possible alliance between Mr Kejriwal's party and the Congress in Delhi. "We will have a pre-poll alliance to remove Modi. Pre-poll alliance so there is no difficulty afterwards," Ms Banerjee said after the meeting. She also said that an alliance in Delhi and West Bengal is not decided yet. The opposition alleges that PM Modi's Bachelor of Arts degree is fake. Some RTI applications were also filed in this regard. The Chief Information Commissioner had directed the Delhi University to allow inspection of records related to all the students who had passed BA degree in 1978, the year in which, according to the university, Prime Minister Narendra Modi had also cleared the examination. The court had on January 23, 2017 put on hold the operation of the CIC order.